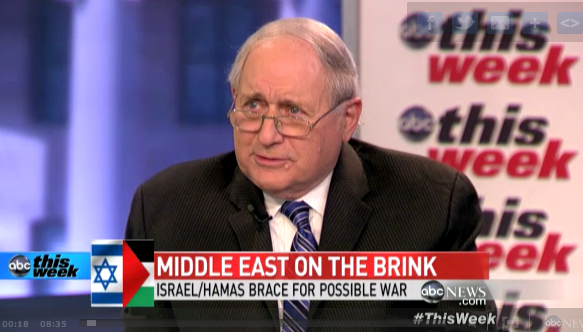 As the State of Israel is engaged in yet another brutal assault on the Palestinians living in Gaza, Michigan Senator Carl Levin does what he has been doing for more than two decades………he’s defending and justifying Israeli war crimes. On Sunday, Levin appeared on ABC This Week with Rep. Peter King to justify and defend the Israeli assault on Gaza. Levin begins by blaming Hamas for the violence. Levin said that Hamas attacked Israel and Israel is just defending themselves. Levin continues the lies by stating that President Obama is doing everything he can to prevent further violence. Levin then adds that we shouldn’t forget the importance of the Iron Dome Air Defense Missile System, which the Israelis developed, along with US financial support. Levin says that, “the President and the US Congress are entitled to a lot of credit,” when is comes to helping the Israelis develop this weapons defense system. For those who have been following Senator Levin’s career, this should come as no surprise. Levin has been one of the more staunch apologists for the State of Israel. Senator Levin’s commitment to Israel, has resulted in him being one of the top recipients of Pro-Israel PAC money over the past 20 years. According to Open Secrets, Levin has received $1,656,735 from Pro-Israel groups in the US, with AIPAC being the largest contributor to the Michigan Senator. Levin has also consistently voted in for legislation that defends Israel, even when Israel commits war crimes, as they did in the 2006 assault on Lebanon and the 2009 assault on Gaza. Senator Levin is as Hawkish as they come, especially when it has to do with Israel. With his appearance on ABC This Week, Levin demonstrates once again how much he defends Israel and supports war crimes. Levin said nothing about the Israeli assault on Gaza, which is disproportionately more brutal than the rockets being fired at Israel. Levin also has said nothing about the Palestinian civilians who have died as a result of Israeli bombs. Apparently Carl Levin doesn’t have a problem with the murder of 11 members of the Al-Dalou family, including 1 year old Ibrahim, 5 year old Ranin, 7 year old Jamal and 10 year old Yousef. When someone attacks a response is supposed to be disproportionate. A good starting point is ten fold response, periodically ramping up by a order of magnitude until the attacker begs for peace. Since Israel’s neighbors have repeatedly started wars and boasted of driving Jews into the ocean, it seems perfectly reasonable that Israel should do the same. Drive all out of Gaza and annex the territory as compensation for past crimes against Israel. Starting and losing a war generally results in loss of land, something which Israel’s neighbors have caused to happen repeatedly. Another apologist for Zionism. Not likely you are a regular reader of this blog, which suggestions you are trolling for any criticism of Israel. Of course you say nothing about Levin being bought by AIPAC and the rest of the pro-Israel lobby and you do not substantiate your claims of Israel being the victim. Israel has illegally occupied Palestinian land since the 1967 war, an occupation that has been condemned by everyone in the international community, except the US. You claim that Israel was responding to an attack, yet it was Israel who started this round of violence and has killed over 100 civilians and counting.